The Ohio is a beautiful river with amazing scenery. I have traveled the entire 981 miles of the Ohio River several times. I have explored it by canoe, cabin cruiser, deck boat, steamboat and towboat. Some are wary of going out on the Ohio River. The following three factors come up in conversations as to why. One is the very size of the river, two is commercial river traffic and the third is the system of locks & dams. Yes, the Ohio is a big river and nearly a mile wide in some places, but so are many lakes that people boat on. I don't see the size really being a "fear factor". Sure, the wind can create some chop, especially in the lower, straighter sections but, again, the same thing happens on lakes. The towboats with their huge barges are intimidating but can be dealt with safely, mostly using common sense. Towboats create a mild rolling wake that is easy to handle. Wakes from large cruisers are more difficult to manage than towboat wakes. The locks are not as scary as they seem to some people. Every vessel has the right to pass through them. If one follows the rules and has patience, locking is quite fun. I have canoed through locks with no problem. The Ohio River provides boaters and floaters a mostly remote river with an abundance of wildlife, forests, islands and places of refuge. With the exception of the cities, it is a natural setting with the advantage of many access sites. Most of the cities and towns are ?user friendly? with regard to the river. Many of the Ohio River towns embrace their river heritage and try to make it easy for traveling boaters to visit. If you know where to find them there are plenty of places for supplies, food, lodging and fuel. For those who want to really get away from it all, the many islands and tributaries offer great anchorage and camping opportunities. Following is a brief tour of the Ohio River. Most rivers begin as a tiny stream and grow in size as tributaries pour into it. The Ohio River starts out as a big river at the confluence of the Allegheny and Monongahela Rivers at Pittsburgh, Pennsylvania (shown at right). 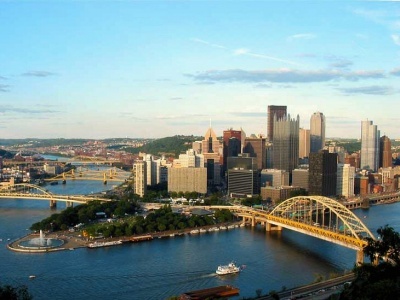 Pittsburgh, as has many Ohio River cities, has done great things to improve their riverfront. For those wanting to experience the Ohio River from beginning to end, the journey must begin here or on the Allegheny or Monongahela Rivers. There are many public access ramps on all three rivers and also plenty of marinas. There are twenty locks on the entire Ohio River. In the upper reaches of the river they are fairly close together (some only a few miles) but as the river continues downstream the locks are farther apart. As with most rivers, there are industrial areas that do not provide the beautiful scenery that most of us seek but many of them are interesting. The huge barge loading facilities and other industry is usually clustered in areas and use relatively little of the 981 miles of the river shoreline. The most noticeable industry are the occasional electric power plants, but once again, these sightings are brief and once past them the upper river is an island studded natural waterway. There are tributaries, coves and island chutes that provide good anchorage on landings for the night. It is a good idea to find these rather than anchor or land along the busy main channel. This is mainly because towboat traffic is noisy and the rolling wakes will rock the boat, plus a landed boat can be driven onto the beach and become grounded. There are also many fleeting areas along the shore where the towboats transfer barges. Check the charts and guidebooks for the best locations to spend the night. Of course there are also many marinas located in quite coves (like the one at left) for those preferring to rent a slip for the night. Getting fuel is never a problem on the upper river with the number of marinas and fuel docks that are normally well marked. Even in the vicinity of the riverside cities there are often remote and scenic places to enjoy. One example is Wheeling, West Virginia. It has a busy riverport with a great deal of industry but if one takes the chute of Wheeling Island, he or she will find a remote and natural setting with only the noise from nearby highways as a reminder that civilization is close by. The aerial photo at right shows some of the things discussed above in one image. Notice the up-bound tow, the islands and the roads running along each side of the river. The Ohio River Scenic Byway is a popular group of roads that run mostly along the river for those who want to enjoy the beauty of the Ohio by car. It is interesting that while those roads and often railroad tracks are present along a great deal of the shoreline of the upper Ohio River, they are mostly not in view from the river below. In fact there are many homes, farm fields and industrial sites near the river but are blocked from view by the corridor of trees along the banks, giving one a sense of remoteness and natural beauty. The Middle Ohio River Valley has its own charm with many small towns that are friendly, accessible and charming. Since the river has many high bluffs along the bank, some communities are built on the narrow section of flat land between the river and the bluffs, This means that rather than spread out in all directions, the town grew in along the bank with some only being one or two streets wide, like Pomeroy, Ohio shown at left. Some towns are hidden behind floodwalls which is unfortunate for those living there who would enjoy seeing the river but necessary to keep the town from being flooded. The great flood of 1937 caused many of these giant walls to be built. The towns are not completely cut off from the river, as they have openings leading to parks, ramps and other helpful things for boaters. Those opening can be closed during flooding with gates or slide-in timbers. Some cities like Portsmouth, Ohio, Maysville, Kentucky and Paducah, Kentucky have these walls painted on the inside with images depicting the history and other interesting features about the area. 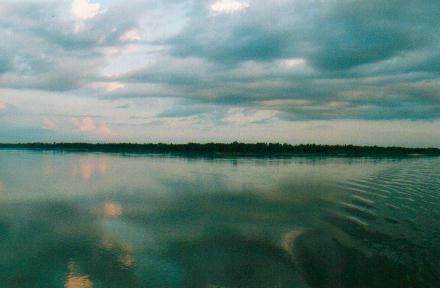 The mouth of the Great Miami River marks the halfway mark of the Ohio River and the border of Indiana and Ohio along the right descending bank, with the left bank being Kentucky. It is interesting to note that even though the Ohio River is a state border, the border runs along the right bank and not in the middle of the river. That means that once the Ohio River leaves Pennsylvania, it is entirely within the states of West Virginia then Kentucky along the left descending bank. There are some places where this varies due to slight river course changes and damming. This has no real affect on those boating the river since the states on both sides of the river have agreements that allow boating regulations and fishing license to be honored by authorities from either state, while on the river on along the shore. This does not cover tributaries going into the river. Once past Louisville, Kentucky area the river becomes even more remote with much greater distances between the locks. The Distance between the McAlpine Lock at Louisville and the Cannelton Lock is 114 miles. This area is also particularly beautiful with plenty of high bluffs alternating between the Indiana and Kentucky shores. There is also greater distances between fueling opportunities so those traveling the lower Ohio River in powerboats must plan wisely considering their fuel range. A river guidebook will provide the information needed to help with this. The towns are also farther apart on the lower river but most of them have good access for supplies. 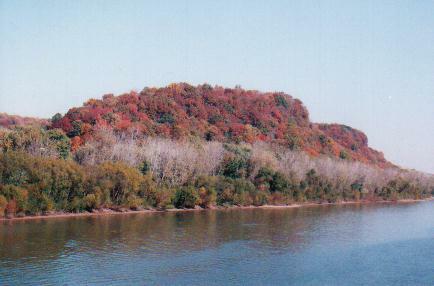 Huge islands and big bends are encountered on the lower Ohio River. Fewer recreational boaters will be seen due to the remoteness. Barge traffic will be present but there is plenty of room to share the river with them. Many Large tributaries enter the Ohio River on the lower section. Those include the Wabash River, Cumberland River and Tennessee River. The Wabash is a non-navigable river but that designation means that it cannot carry commercial traffic. It can be used by those in pleasure craft but caution must be used if taking a side trip, as it can be swift and shallow in places. The Tennessee and Cumberland Rivers are navigable. Information about all these rivers is available on this web site. The photo at left shows the Cumberland River flowing into the Ohio River. The Cumberland is to the right of the point. A nice side trip from the Ohio River is to go up the Cumberland and lock through to Lake Barkley, then take a short canal to Kentucky Lake, which is the Tennessee River. Then lock though Kentucky Dam and go down the Tennessee River to Paducah, Kentucky where the Tennessee River flows into the Ohio River. Plenty of marinas can be found on Lake Barkley and Kentucky Lake. Once past Paducah the shoreline flattens out as the river approaches its end. The Ohio River ends at the confluence with the Mississippi River at Cairo, Illinois. This confluence borders Kentucky, Illinois and Missouri. Even though the Ohio River is much wider and carries more water than the Mississippi where they meet, the Ohio is considered the tributary to the Mississippi. Where the rivers meet, the muddy brown water of the Mississippi and the most often blue waters of the Ohio River run next along each side of the river for several miles before mixing to one color. Look closely at the photo at right to see the color differences. This was taken from the point at the confluence with the Ohio on the left and the Mississippi on the right. Want to explore the Ohio River? There are many printed materials and electronic devices that are an aid to navigation of the Ohio River. The U.S. Army Corp of Engineers provides chart books; however, they are designed primarily for commercial traffic. The chart books do not show m ost of the adjacent roads, nor do they show supply information, interesting and historic sights or marina information. These books are large and it requires three of them for the entire length of the Ohio River. For large craft, one can purchase these charts on CD and use a laptop computer; however, this will give you little more information than the paper charts. There are inland cruising guides that provides marina information but little else. Cruising guides cover many waterways in one book, so there is limited information about a specific river. There are maps, charts, GPS systems and other devices to help navigate the Ohio River, but until the Ohio River Guidebook was published there was no single portable source for all of the detailed information about the river for the true voyager. Many people want to do more than travel on the river. They want to explore it, learn about the history and be able to find on-shore facilities and places of interest. Got back last week from eight days - Sept 2nd through Sept 8th - kayaking on the Ohio River - using your guide book - and wanted to tell you what a great time we had. We launched at Portsmouth (Ohio) and ended our trip at New Richmond (Ohio). We originally thought we would go into Cincinnati but decided that we would have to camp some where on the Metro Cincinnati waterfront and couldn't figure out where or how. Plus, we would have had to do 17 miles to finish the day at one of the marinas, which was a bit over the best mileage we had done on the trip. Probably do-able, but we decided not to chance it. So we spent two nice days at the B-and-B you (Ohio River Guidebook) recommended in New Richmond. The river was really neat. The first two or three days were really rough. We started at Portsmouth on September 2nd and had three days of 90-plus degree weather. Your (Guidebook) was right about camping: No problem and there were lots of places to tent camp. We would start looking for a place about 4 PM and generally find a nice place within a half hour. We met all sorts of super people on and besides the river. Folks were interested in our trip. One guy, that we met at Nace Run, came looking for us the next day because he was worried that we might have had trouble with the fog. We camped on the river bank, in the public marina at Maysville and Augusta, Kentucky, and at the public ramp in Neville, Ohio. Never had any problem with the towboats. In fact, their wake was really fun. The only thing was they were really loud at night when the came chugging by. At our camp down river from Vanceburg, KY, one of then idled for what seemed to be hours just upriver from us. I thought his prop wash was going to wash the bank away. Maybe he had ordered a pizza from town and was waiting for it. Vanceburg no longer has a public ramp on the river. It was filled in with rocks. We put in on the riverbank and climbed up the hill. Great place to eat at the drug store. Rome, Ohio, has a small general store located a couple of blocks from the top of the public ramp. The camping at Ripley, Ohio, marina is really, really, primitive. Great trip. Can't wait to get back on the river. For canoeists, kayakers and pleasure boaters planning a trip on the Ohio River, "The Ohio River Guidebook" should be essential reading. Author Jerry M. Hay covers locks and dams, marina information, history, anchorage locations and information on cities and towns. Hazards are marked and described, along with ramps and other access points. Hay has repeatedly traveled the length of the Ohio by power boat, canoe, steamboats and towboats. He's also driven all the river roads on both sides, and he lists "river friendly" towns that provide good access and services to transient boaters. Hay also lists communities with historical or charming waterfronts that are worth a stop. The guidebook begins in Pittsburgh and progresses through 89 sections downriver to the Mississippi River. After reading the Ohio River Guidebook, I have just ordered another one as a gift for a friend who has a houseboat at Four Seasons Marina. Nice book! It is a must for anyone who wants to travel on the river. Got the book and just wanted to take a minute to tell what a nice piece of work you've done. My wife, Patricia, says to tell you that the book makes the river seem very doable and intriguing. Now we just have to decide where we want to spend our 10 days. Thank you for all the effort in putting together the Ohio River Guide. I am planning to canoe the whole thing starting Aug. 31 in Pittsburgh and the army corps books are just too big. So I'm looking forward to the book a lot. I usually go through the Army corps one and type out only the info I want to have it handy but need the maps. I was dreading having to look though them in a canoe. Yours will be so much easier........Got the book today and I love love love it. Thanks a million for all your effort. I'm sure when I'm done with it I will be able to attest to its usefulness and survivability. I hope others appreciate it as much and Ill be spreading the word about it to everyone. Your White River and Wabash books are great, but that Ohio book is your Mona Lisa...it is absolutely gorgeous!